Helper functions for displaying and debugging MoveIt! data in Rviz via published markers, trajectories, and MoveIt! collision objects. It is sometimes hard to understand everything that is going on internally with MoveIt!, but using these quick convenience functions allows one to easily visualize their code. 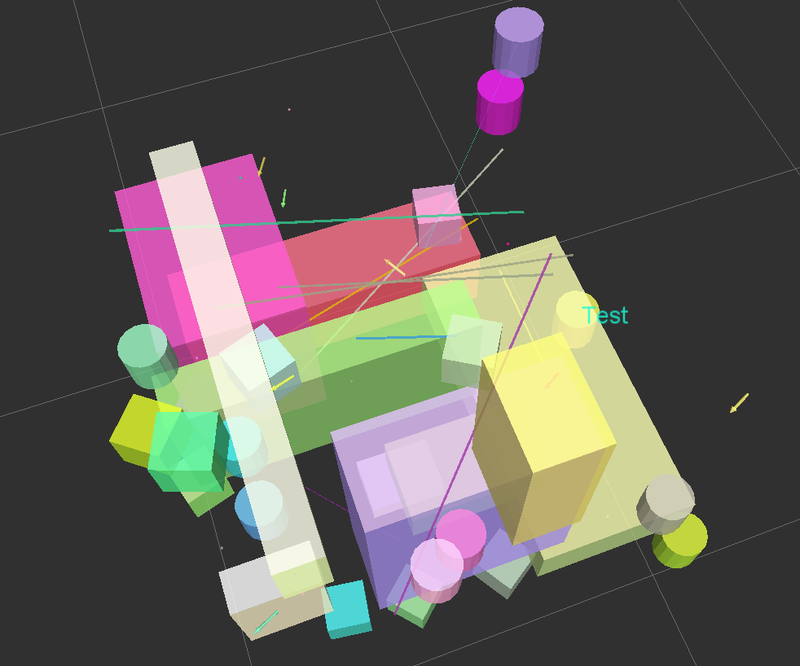 This package is built in top of rviz_visual_tools and all those features are included via class inheritance. Developed by Dave Coleman at the Correll Robotics Lab, University of Colorado Boulder with outside contributors. We'll assume you will be using these helper functions within a class. Helpers for adding and removing objects from the MoveIt! planning scene. CO stands for Collision Object and ACO stands for Active Collision Object. This class is built on top of rviz_visual_tools so all features and documentation for that package apply here as well. Please send PRs for new helper functions, fixes, etc! 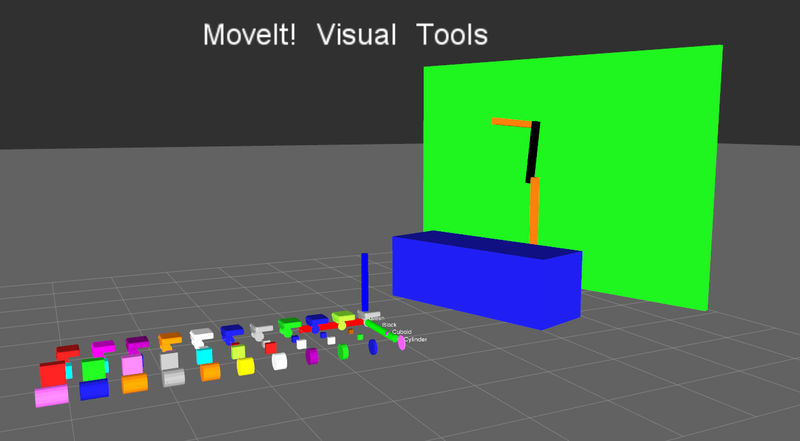 Helper functions for displaying and debugging MoveIt! data in Rviz via published markers, trajectories, and MoveIt! collision objects. It is sometimes hard to understand everything that is going on internally with MoveIt!, but using these quick convenience functions allows one to easily visualize their code. We recently did a major refactor of moveit_visual_tools in Indigo that caused some API breaking changes. If you do not want to bother, you can still build the old version from source using the branch indigo-devel-old-api. Change the first parameter to the name of your robot's base frame, and the second parameter to whatever name you'd like to use for the corresponding Rviz marker ROS topic. Start rviz and create a new marker using the 'Add' button at the bottom right. Choose the marker topic to be the same as the topic you specified in the constructor. In the following snippet we create a pose at xyz (0.1, 0.1, 0.1) and rotate the pose down 45 degrees along the Y axis. 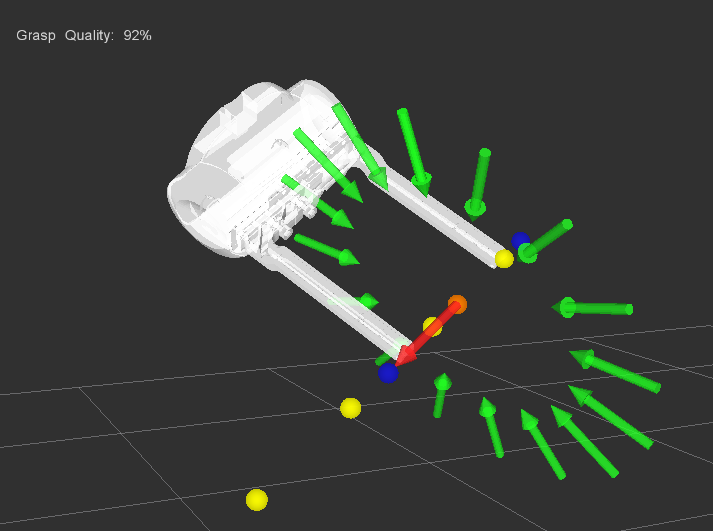 Then we publish the pose as a arrow for visualziation in Rviz. Make sure your Rviz fixed frame is the same as the one chosen in the code. deleteAllMarkers - tells Rviz to clear out all current markers from being displayed. Only withs in ROS Indigo and newer. This will cause all new markers to overwrite older ones. Feel free to send PRs for new helper functions, fixes, etc. - I'll happily discuss and merge them. I do not, however, want to send much time helping people use this because I am a busy grad student. Use at your own risk. This package is built in top of rviz_visual_tools and all those features are included. Try running the rviz demo documented on this README.